Left to right: Jay Tichenor (FOPB Trustee & recent past president), Michael Lach (HCT Exec. Dir. ), Dolly Howell (FOPB President), Charlie Beggs (FOPB Treasurer). To help the Harwich Conservation Trust (HCT) raise funds for preserving 49 acres in the Pleasant Bay Watershed, the Friends of Pleasant Bay (FOPB) donated $50,000 as part of a multi-year $100,000 pledge. The John T. Ryan Jr. Memorial Foundation, and 3 anonymous families have pledged a combined $1.8 million for the "Pleasant Bay Challenge" under which every donation to HCT will be matched dollar-for-dollar up to $1.8 million until August 2014 by FOPB and fellow challenge donors. This photo of Pleasant Bay looks across Pleasant Bay from Wequassett. Looking to the future, FOPB (www.fopb.org) is exploring larger scale projects like the 49-acre effort in order to protect Pleasant Bay. To donate to the 49-acre Pleasant Bay Woodlands Project, visit www.HarwichConservationTrust.org or call HCT's Mike Lach at 508-432-3997. Thanks to strong support from Senator Dan Wolf and Rep. Sarah Peake, the state's Executive Office of Energy and Environmental Affairs announced an $85,000 grant toward Harwich Conservation Trust's (HCT) 49-acre Pleasant Bay Woodlands Project. HCT now has less than $800,000 left to raise in the $3.6 million campaign to preserve the largest remaining unprotected landscape in the 21,000-acre Pleasant Bay Watershed spanning the four towns of Harwich, Chatham, Orleans and Brewster. The 49-acre landscape is located in East Harwich, within the municipal public water supply recharge area for nearly 10,000 households, and feeds groundwater directly into Pleasant Bay. If not preserved, the land could become a subdivision of up to 40 lots. HCT has until August 2014 to raise the remaining funds. To learn more or contribute, please visit: www.HarwichConservationTrust.org. The Platinum Pebble Boutique Inn held a fund-raiser run on Thanksgiving morning to support the Harwich Conservation Trust (HCT). Inn guests, friends and locals were invited to participate in the inaugural "Platinum Pebble Dash," a 5m/5km run/walk in Harwich. "The 15 participants donated an entry fee thereby enabling $250 to be raised for this worthy local non-profit organization that does such a sterling job in preserving and sustaining the natural landscape and critical ecosystems of Harwich," said Simon Hunton, who owns the 8-room bed & breakfast inn with his wife Annabelle (www.platinumpebble.com). Pictured left to right: Michael Lach, HCT Executive Director and Simon Hunton, owner of The Platinum Pebble Boutique Inn. with strong support from the Town of Harwich Natural Resources Department. River Beach, Neil Road Beach, Wychmere Harbor, Bank St. Beach, Earle Rd. At the first ever Wildlands Musical Stroll, more than 300 visitors enjoyed live acoustic folk, classical and jazz music played by musicians on piano, guitar, accordion, bass, ukulele, percussion, even a wearable washboard and other instruments as artists from the Guild of Harwich Artists painted the landscape in celebration of the 25th Anniversary of the Harwich Conservation Trust (HCT) while walking the trails at HCT’s 66-acre Bank St. Bogs Nature Preserve in Harwich Port. The famous “piano in the woods” mysteriously abandoned on conservation land in 2009 even made an appearance courtesy of the Harwich Historical Society. Thanks to outstanding support from local businesses, volunteers, town departments, and HCT’s summer college interns Kristen Kuzil and Kaileigh Tremble, the Wildlands Musical Stroll was a terrific success. Visitors enjoyed the fresh air and scenery while listening to live music and watching inspirational art unfold. The event also helped us raise funds in support of HCT's 49-acre Pleasant Bay Woodlands Project. To see event photos, visit www.HarwichConservationTrust.org. The Board of Directors of The Compact of Cape Cod Conservation Trusts, Inc. unanimously chose Robert F. Smith of Harwich to receive the Ansel B. Chaplin Award for outstanding efforts to preserve open space on Cape Cod. The presentation was made at the 27th Annual Meeting of The Compact cohosted with the Harwich Conservation Trust’s 25th Annual Meeting at the Wequassett Resort on Pleasant Bay in Harwich. Named in honor of The Compact’s founding President, Ansel B. Chaplin of Truro, this award is intended to recognize and celebrate significant work conducted by an individual or group of persons to increase the amount and quality of legally protected conservation land in Barnstable County. The award could be for a single major project or a lifetime of dedication to the cause of open space. Volunteers who have inspired others to join the cause are particularly noteworthy. Past recipients of the Award are the late D. Isabel Smith of Harwich, the late Charles H. Thomsen of Orleans, Henry Kelley II of Dennis, Susanne Goodman Hallstein of Falmouth, the late Robert G. Hankey of Wellfleet, Anne G. Gould of Cotuit, Henry Lind of Eastham, Celine Gandolfo of Provincetown, John Nye Cullity of Sandwich, and Andy Young of Chatham. “It's easy, I suppose, to say that Bob’s work is mostly about Harwich, but HCT's existence is largely due to his perseverance. The fact that it thrives now is part of the team chemistry that he envisioned years ago, and that he continues to inspire now. The HCT ripple effects have, I suspect, touched every similar conservation organization on the Cape in one way or another.” Tom Evans, HCT Trustee and Vice-President. “As president and a founding member of the Harwich Conservation Trust, Bob has deftly changed the course of land conservation in Harwich for the better. Whatever project he embarks on, he creates a team of professionals and volunteers that know how to achieve goals with excellence in outcome and kindness in process. Bob is an exceptional, service-minded individual.” Patty Watson, HCT volunteer. “As a member of the Town of Harwich Real Estate and Open Space Committee, I have had the pleasure of working with Robert (Bob) F. Smith as he has led the Harwich Conservation Trust (HCT) in protecting valuable open space across Harwich. HCT is the Cape's youngest land trust and is now among the most active in all aspects of land protection from preservation to stewardship to community outreach. Bob's experience as a highly respected real estate attorney and his leadership have guided HCT to preserving hundreds of acres. As the only founding trustee on the HCT board, he brings an unsurpassed institutional memory of events, key figures, political changes, and market shifts for 25 years that guides current and future land protection projects.” Margo Fenn, former Executive Director of the Cape Cod Commission. The Compact of Cape Cod Conservation Trusts, Inc. is a regional non-profit service center that was founded in 1986 to provide assistance to local non-profit land trusts and communities engaged in protecting open space throughout Barnstable County. Now, 27 years, later, 23 local and regional land trusts and watershed associations belong to The Compact, representing all 15 towns on the Cape. The Compact’s staff provides technical expertise on land acquisition and land management, fundraising, research, tax benefits and nonprofit administration. HCT's Executive Director Michael Lach also serves as Assistant Director of The Compact. To protect land, water and wildlife, two long-time Cape residents have donated three forested properties along South Street and Forest Street to the nonprofit Harwich Conservation Trust. The land donors prefer their privacy and opted not to be interviewed. By preserving the land, they could benefit from a federal income tax incentive for conservation restriction donations as well as the state’s new Conservation Land Tax Credit program. The parcels provide woodland habitat as well as wetland features for a diversity of wildlife. The land happens to be located entirely within rare species habitat as mapped by the Massachusetts Natural Heritage & Endangered Species Program. Because of the habitat mix, a variety of bird species inhabit the area. The calls of northern flicker, great-crested flycatcher, oriole, catbird and other birds can be heard in the neighborhood. “These land donations also advance HCT’s broader Save Land – Save Water Initiative,” said Michael Lach, HCT’s Executive Director. HCT’s Save Land – Save Water Initiative is a long-range plan to protect sensitive saltwater and freshwater resources by strategically preserving watershed lands. The wetlands on these parcels eventually drain via groundwater to Allen Harbor and Saquatucket Harbor on Nantucket Sound. One parcel is in the Saquatucket Harbor watershed while the other two are in the Allen Harbor watershed according to the Town of Harwich Draft Comprehensive Wastewater Management Plan. “By preserving specific watershed lands, we can help protect harbor water quality, which also reduces the cost to taxpayers for future wastewater infrastructure,” said Lach. 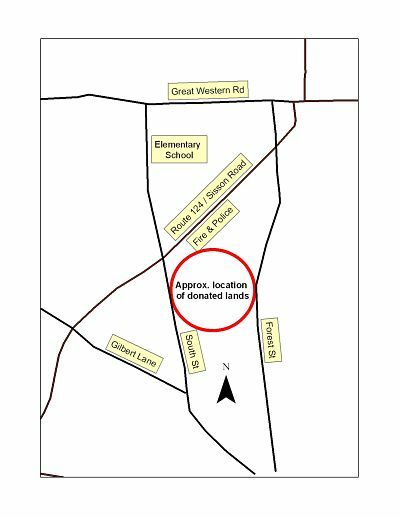 Outright donation, also called fee simple donation, of land to a nonprofit land trust is one of the simplest ways to protect land. The donor can potentially receive a federal income tax deduction for the value of the gift against 30% of adjusted gross income for up to six years. The donor needs an appraisal when the claimed value of the deduction is more than $5,000. The donor also no longer has to worry about local property tax or liability. Landowners can now benefit from the state’s new income tax credit. You do not need to reside in Massachusetts or even pay taxes here. If you own the land, and the land qualifies, you qualify. If you are an eligible landowner, your state income tax could be eliminated for the year, and the State would issue a check for the difference between the amount of that tax, and $50,000 or 50% of the land’s appraised value, whichever is less. HCT is working with more landowners right now who will benefit from the tax credit. “The new refundable state income tax credit is an attractive incentive for folks who are looking to preserve land and benefit tax-wise,” said Lach. “Land donations account for most of the properties preserved by land trusts across Cape Cod. Land donation can also result in tax-savings for the donor,” according to Paula Pariseau, Senior Land Protection Specialist of The Compact of Cape Cod Conservation Trusts, Inc. (www.thecompact.net), a nonprofit land trust service center. While it continues to complete land donation projects for several parcels across Harwich, HCT also recently launched its Pleasant Bay Woodlands Project. If HCT can raise $3.6 million, then it can purchase 49 acres which includes the largest remaining unprotected parcel in the Pleasant Bay watershed. Groundwater beneath the 49-acre landscape flows directly into Round Cove on Pleasant Bay. Thanks to generous challenge donors including the Friends of Pleasant Bay, Wequassett Resort, The John T. Ryan, Jr. Memorial Foundation and three anonymous families, every dollar donated to HCT up to $1.8 million will be matched dollar-for-dollar. “It’s HCT’s 25th Anniversary Year, so we’re striving for success on many fronts to save special places,” said Lach. For more information about HCT and the Pleasant Bay Woodlands Project, visit www.HarwichConservationTrust.org. Join Harwich Conservation Trust (HCT) Stewardship and Outreach Intern Kristen Kuzil on a walk through the scenic Monomoy River Conservation Lands. Learn about the history of this land and the importance of the Monomoy River (aka Muddy Creek), all while taking in views of beautiful Pleasant Bay. Registration: This walk is free, but please register in advance by emailing [email protected] or calling HCT at 508-432-3997 and pressing 4. Join Harwich Conservation Trust (HCT) Land Steward Intern Laura Carhart for a walk through Thompson’s Field. Learn about a variety of local species that inhabit the area and the importance of preserving wildlife habitat. Bring binoculars to get a better look at local species. All ages welcome. Directions to the South Trailhead: From Rt. 39, take Chatham Road southeast 0.75 miles to a parking area on the left. Join Harwich Conservation Trust (HCT) Stewardship and Outreach Intern Kristen Kuzil for a walk through the Town’s Texeira Conservation Lands. On this walk you will learn about meadow habitat along with the history of this land. The Harwich Conservation Trust is a leader in creating public-private land conservation partnerships that sustain Harwich as a livable, vibrant community for current and future generations. Visit out website, and visit our many projects. Call us at 508-432-3997 or email your comments to [email protected].